Supervriendelijk klantencontact en zeer behulpzaam toen ik een eigen icoontje wilde hebben. 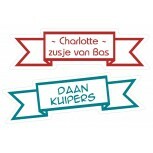 Na de betaling werden de labels de volgende dag al geleverd! 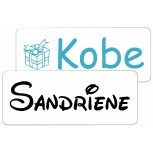 Special name labels that makes the birth gifts of your baby(s) personalized and complete. 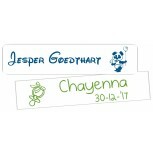 30 transparent sticky 'banner' labels. Your baptism sugars deserve a banner ribbon! 30 white sticky 'banner' labels. 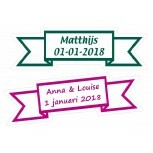 Your baptism sugars deserve a banner ribbon! 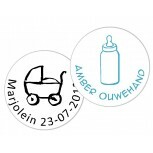 36 transparent adhesive labels for baptism sugars nowadays! 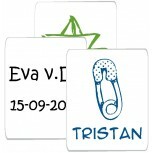 36 white personalized adhesive labels for unique baptism sugars! Transparent, compact adhesive labels for the smaller baptism sugars. 22 pcs. 22 rectangular white adhesive labels for the smaller baptism sugars. Suitable for on oa. baptism sugar bottles, jars, and other larger birth gifts. 10 pcs. 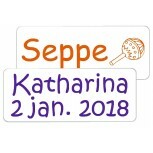 Round transparent name labels make your baptism sugars unique and personal. 24 pcs. White name dots make your baptism sugars unique and personal. 24 pcs. 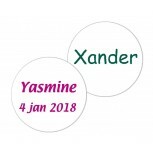 Transparent round name labels with text make your baptism sugars completely amazing. 24 pcs. 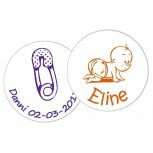 24 round 'flex' iron-on name labels makes your ' textile ' baptism sugars particularly personal. 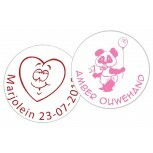 24 round 'flex' iron-on name labels makes your ' textile' baptism sugars completely complete.